Chloe Hornbostel and Audrey Deck won this year's Vail Christian High School Honors Scholarships. EDWARDS — A pair of local eighth-graders won this year’s Vail Christian High School Honors Scholarships. Audrey Deck, of Eagle County Charter Academy, and Chloe Hornbostel, of Vail Christian Academy, received scholarships totaling $40,000 over four years for each of them. “This year’s talent pool was incredibly deep, with lots of the valley’s best and brightest applying. 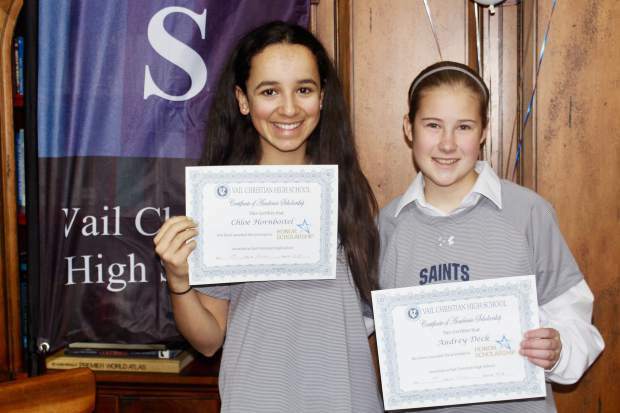 Chloe and Audrey surfaced as standouts in the midst of a gifted crowd,” Vail Christian Head of School Steve O’Neil said. Fourteen students from the school’s 40-member incoming freshman class applied for the scholarships. Of those, five were chosen as finalists. The two winners were chosen on the basis of grades, standardized test scores, teacher recommendations, two essays and two interviews. Hornbostel thanked her teachers throughout her elementary and middle school years. “They believed in me and pushed me to do better than just good, to excel and always work harder,” Hornbostel said.